The world as we know it, is quickly falling apart. Organisations are facing change or even disruption. Customers and young technology talent are less loyal, more demanding and increasingly assertive. To top it off, there’s a growing (information) chain-dependence. What new kind of structures do we need to address all this? Is hierarchy really obsolete? Is technology the answer to everything? And what’s the role of the CIO in these new dynamics? Do organisations need a new type of IT leader (Chief Digital Officer/Chief Technology Officer)? And perhaps the most important question: is the board, from CEO to COO and CFO, ready to face the tech driven disruption? Join the CEO Panel at CIODAY to hear how Top Leaders confront these issues! CIODAY 2017 is over, but the experience lives on. Relive CIODAY 2017 by watching the Aftermovie. AMSTERDAM, 22 November – Bouke Hoving, CIO of KPN, is the winner of the CIO of the Year Award 2017. He believes his win is due to the transformation of KPN into a customer-driven organisation with an integrated and user-friendly range of products and services. “He really made the difference for his company,” motivated jury chairman Bernhard van Oranje. The winner scored high on all parts of the selection process. Both within the qualitative and quantitative research by The Boston Consulting Group (BCG), the intensive leadership assessment of Linqhu, and the final jury discussion, he belonged to the best. 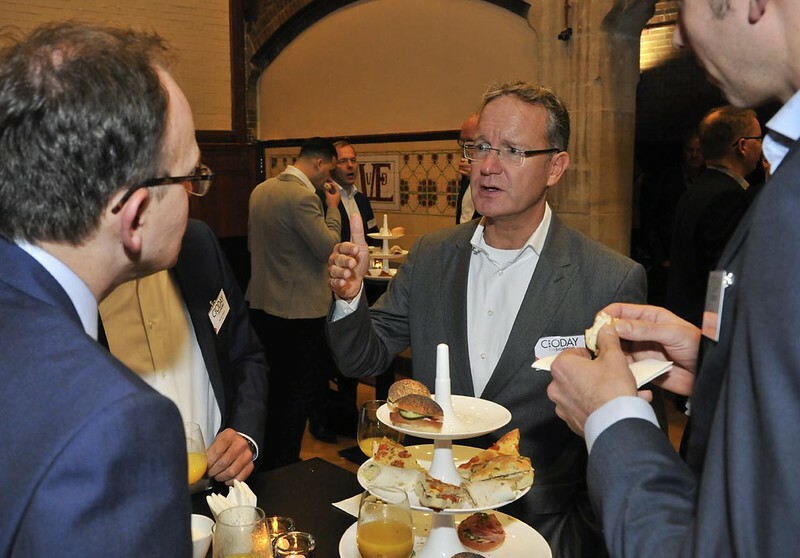 Within the Dutch CIO community, he also counts as a valued and accessible inspirer. “With Bouke Hoving, We have chosen a leader who can put his vision into words and does everything he can to help his organization move forward. He has proven that aswell, “says Van Oranje. The announcement took place yesterday during CIODAY2017 in the Amsterdam Beurs van Berlage. More than 750 high-level IT officers witnessed this. Nominated for the CIO of the Year Award 2017 were: Arthur Govaert (Radboudumc), Bouke Hoving (KPN), Jaco van Goudswaard (Kadaster), Leo Brand (Vopak), Olli Hyyppä (NXP) and Ton van Rhijn (CZ). At the CIO of the Year Award, a strict and objective process was followed, whereby the prize was awarded to the person who scores the highest on the performance achieved and the way he or she stands in his / her role and position. In the assessment by BCG and Linqhu, things counted as performance, perception by the business and personal competencies. A striking difference with previous years is that in the BCG research more attention has been paid to the so-called ‘digital accelerator index’, in which the real digital enablers can be identified. On the basis of all this, several CIOs stood out. The final meeting in the Pinnacle Tower in Amsterdam was the last validation of the selection process. The entire Jury of the CIO of the Year Award and Nominees: Arthur Govaert (Radboudumc), Bouke Hoving (KPN), Jaco van Goudswaard (Kadaster), Leo Brand (Vopak), Olli Hyyppä (NXP) andTon van Rhijn (CZ). The core jury was formed by Marc Schuuring (Boston Consulting Group), Tjibbe van der Zeeuw (Linqhu), Rob Beijleveld (ICT Media) and Hotze Zijlstra (CIO Magazine). Marcel Krom (CIO Platform Nederland and PostNL) was interviewed by Sjourd Wijdeveld (CIO SHV Energy) during the final jury discussion. Bernhard van Oranje (Levi9) was again chairman of the jury. New in the company was Arnoud Klerkx (Kramp), who will make way for the winner of the 2016 CIO of the Year Award for the 2018 election: Ron van Kemenade (ING). Interested in the (Dutch) long read about all the nominees? Read all about it here. CIODAY is over but you can relive CIODAY right here with the photos taken by our photographer Roelof Pot. Slider not working? Watch them here directly. The question is no longer why organisations have to change or transform, for this is obvious in the field of forces dominated by ‘digital, data and disruption’. What has to happen is also clear. All that matters now is how. The editors as well as many partners of CIODAY2017 share their views on this topical issue. Of course lots of attention as well for the CIODAY programme and the nominees of the CIO of the Year Award.